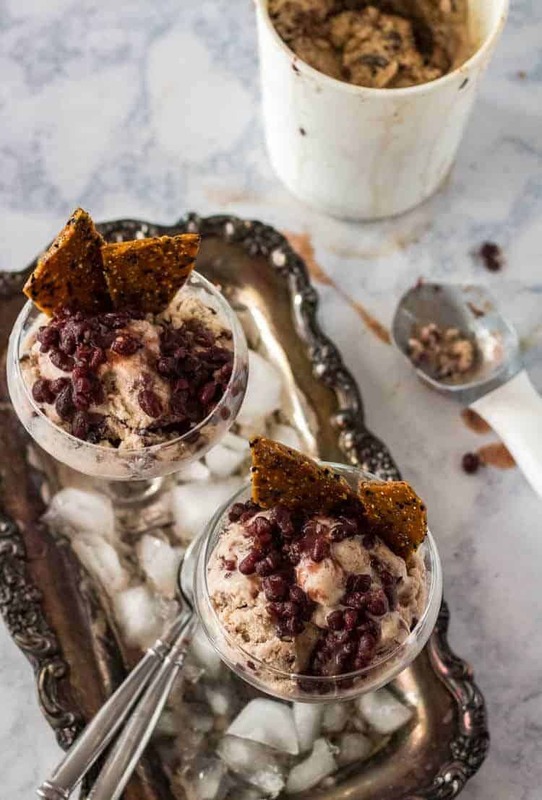 Subtle Asian flavors and lots of texture define this Red Bean Frozen Custard with Sesame Brittle… A hint of ginger, coconut milk, and sweetened red beans (adzuki) transform this frozen custard from basic (and delicious) to otherworldly! Have you ever had a sweet Asian treat like red bean buns (Dou Sha Bao) or sweet mochi with red bean filling (Daifuku)? Red beans (adzuki) are pantry staples in many Asian cuisines. I have never focused on creating “authentic” dishes that are true to a specific cuisine. Rather, I focus on a flavor profile to create something new (and hopefully) delicious! I have enjoyed red bean ice cream in restaurants many times – smooth, silky, pink, and only lightly sweet perfection! I wanted the texture of the red beans to shine in my Red Bean Frozen Custard with Sesame Brittle. The frozen custard does have a subtle coconut-ginger flavor, but the earthy flavor of the red beans shine through. 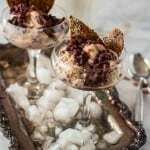 I finish this light, tasty dessert with a simple scoop of sweetened red beans and a scrumptious salty-sweet black and white Sesame Brittle. For more about red beans (adzuki), see Instant Pot Adzuki Bean Soup with Miso, Winter Squash, and Kale. They’re awesome in savory dishes as well! Don’t be intimidated by the custard base. By definition, custard is milk or cream cooked with eggs. Start by gently heating the liquids (I specify coconut creamer and lite coconut milk) with the sea salt. Whisk regularly. When the mixture is hot (but not boiling), you will temper the eggs. Bring the mixture back up to temperature (just below a boil). Whisk in the bourbon, corn and red bean syrups, and fresh ginger paste. Lastly, gently fold in the red beans and mashed red beans. Chill this mixture before proceeding. The Sesame Brittle can be made before, during, or after. It’s also great left over (just ask my hubby)! It’s a basic brittle recipe, and requires only about 5-10 minutes to make. A candy thermometer is helpful. The mixture should be a dark caramel brown before it is removed from the heat. Freeze according to manufacturer’s instructions for your ice cream freezer. This frozen custard comes out of the freezer fairly firm. I recommend serving immediately. If you prefer to save it for later, freeze in an airtight container. Heads-up: It freezes very, very hard. I know from experience. I found that 30 minutes in the refrigerator made it scoopable. 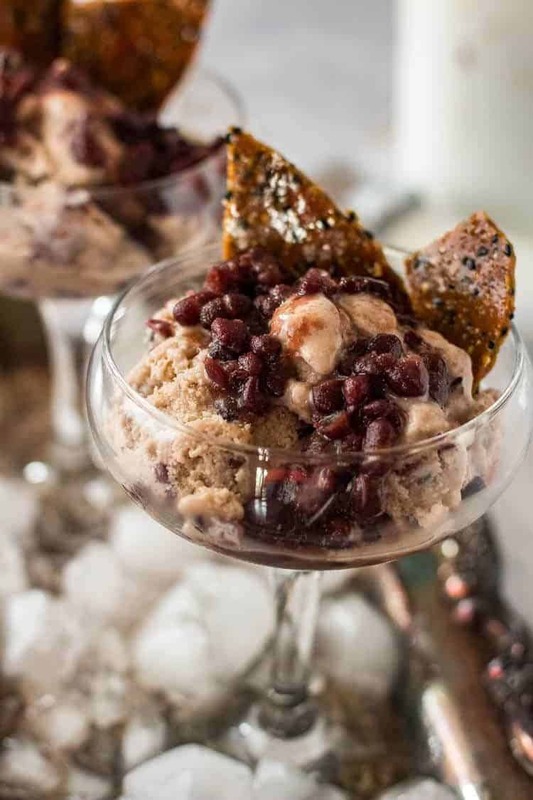 Subtle Asian flavors and lots of texture define this Red Bean Frozen Custard with Sesame Brittle... A hint of ginger, coconut milk, and sweetened red beans (adzuki) transform this frozen custard from basic (and delicious) to otherworldly! Start by gently heating the coconut creamer and lite coconut milk with the sea salt in a saucepan. Whisk regularly. When the mixture is hot (but not boiling), temper the eggs. This process avoids curdling and is important! 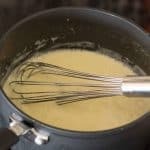 Simply beat the eggs until creamy, then add small amounts of the hot liquid into the eggs with a ladle, whisking constantly. After you've got a warm egg/liquids mixture, add into the saucepan. Bring the mixture back up to temperature (just below a boil). Whisk in the bourbon, corn and red bean syrups, and fresh ginger paste. Lastly, gently fold in the red beans and mashed red beans. Chill this mixture before proceeding. Freeze according to manufacturer's instruction on your freezer. Lay a sheet of aluminum foil next to your cooktop. Have your salt grinder or sea salt shaker at the ready. To a small saucepan, add the butter, sugar, salt, and water. cook over fairly high heat until the mixture is dark, caramel brown (about 260 degrees with a candy thermometer). Stir in the sesame seeds. Pour the mixture onto the foil. Using a silicone spatula, spread to a thin layer (about 1/8" thick). Immediately salt. Allow to cool, and break into pieces. Scoop into (pretty) serving dishes. Garnish with sesame brittle. Add a scoop of sweetened red beans in syrup if desired. Enjoy! 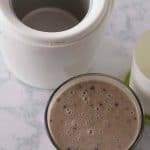 I use both non-dairy coconut creamer and canned coconut milk in this recipe. The coconut creamer has more body (similar to half n' half) than non-dairy coconut milk. We limit dairy products, and this combination works well. However, you can sub in half n' half if you prefer. I made my own red beans in my pressure cooker for Instant Pot Adzuki Bean Soup with Miso, Winter Squash, and Kale and had plenty of extra beans. I simmered the cooked but still firm beans with a 1:3 ratio of sugar to beans for about 30 minutes. Sweetened Red Beans are available on Amazon. Bourbon is optional, but it improves the scoopability of the final product. See The Real Rules of Making Boozy Ice Cream. For the Sesame Brittle, you don't have to do both black and white sesame seeds (but it makes a more striking brittle). 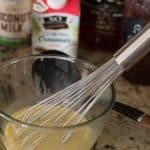 Use a total of 6 tablespoons +/-. You knew we would be over visiting you on this post! Love it! A little taste of Asia any way we can. Just pinned! 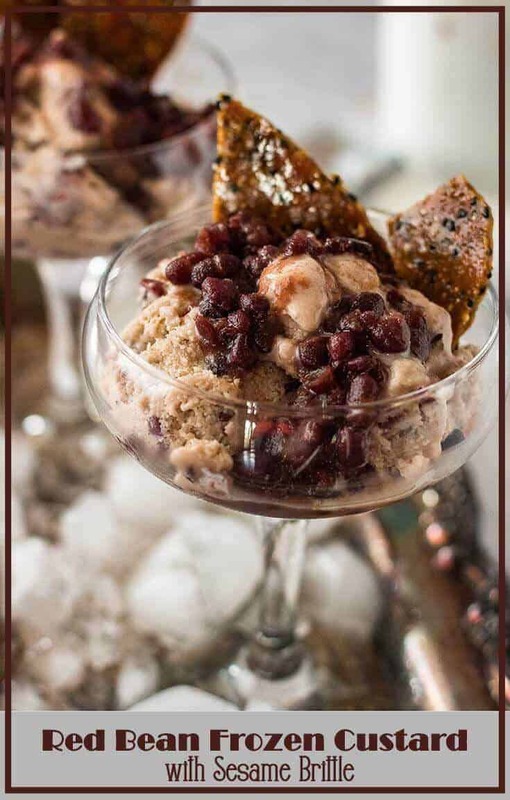 This is a really elegant dessert, with the red bean topping and the sesame brittle. The flavor of the ginger really comes through. Thank you darling! I especially love the sesame brittle contrast of texture and flavor!